There are lots of different ways to categorize kayakers. When it comes to river running, I think you can divide everyone into one of two camps: Drifters or Drivers. Some folks like to drift down the rapids, making corrections when needed but not moving with a lot of speed. These are typically the playboaters - they are used to moving slowly and using the river features to push them where they want to go. When I first started kayakers one of my mentors who I followed down many a river was a drifter - normally in his playboat regardless of how hard the run was. Following behind him I would struggle to be as patient and not run him over in my creek boat. I recently was following him down a river he first led me on years ago and once again realized that without a thought I was charging past him. But this time I didn't try to slow down and imitate his line - I am a driver and that is how I enjoy paddling and what works best for me. Drivers don't constantly charge all out but they keep moving actively with a blade in the water, keeping the boat on line instead of having to make adjustments. It's just a different style, no better or worse, but a good thing to know about yourself. I've seen many people try to copy other boaters, those they perceive as better. I've done it myself. But at some point you need to be your own paddler and understand how you should do things for yourself. It's fine to learn from others but make it many others - try to watch a lot of different good boaters and see what makes them good. Go ahead and try both styles and see what feels right and what gives you better results. Don't be afraid to mix it up when you can but when you get into serious water (whatever that is for you) then you are better off playing your best card and using your strongest style. Another good reason to know if you are a Drifter or a Driver is to get the boat that complements your style. Planing hulls are generally slower downriver but can carve and steer easier; displacement hulls require more constant paddling to stay online and more work to correct but reward you with more speed and better tracking. 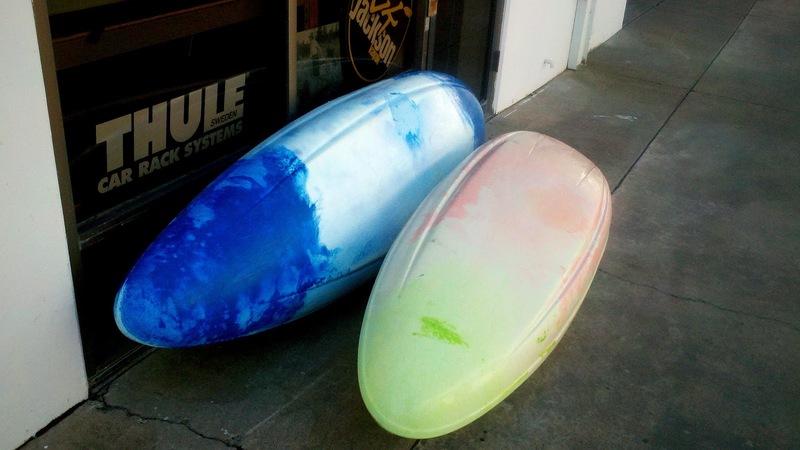 Of course most creek boats are a blend of the two concepts but will lean more towards one than the other. I recently took a short break from my Villain (semi-displacement) to try out the new Hero (planing). While I was quite impressed with the Hero and paddled it fine - it just wasn't as natural for me (full review). I'm much more comfortable in my faster, rounder boat. And that comfort and naturalness translates to better paddling whatever your style. I learned to whitewater kayak on the Kern river and it definitely holds a special place in my heart. So the annual Kern River Festival is an event that I will not miss - even if I have to drive six hours just to get down there. I made it down in time for a couple practice laps on Brush Creek Friday afternoon and the flow was perfect - a medium level that padded it out but still fairly non-consequential. On Saturday I did the Brush Creek race but skipped out on the slalom portion in order to get some pictures and video. The weather was perfect the whole weekend - warm enough to make the river rise 50% in two days. The extra flow made the slalom in the park challenging for those involved but it made the spectators quite comfortable. One of the interesting things at the festival was the mix of people. Since I moved away from SoCal the visiting the Kern is always like a homecoming - a chance to see old friends and catch up on what's happened since last season. Though this year it seemed like fewer of the old guard were around - the people I started my career with being pulled away by other parts of their lives. But there were new friends around, SoCal boaters who are now the locals while I am a visitor. It's nice knowing that even as the players change the sense of family on the Kern remains. And while most paddling communities have their own sense of family the first family you are a part of is the one that shapes you most and the one where you always know you can return. 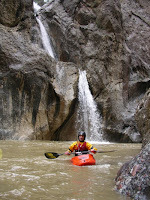 When I first started creeking it was a rainy winter in Los Angeles. First up was the Arroyo Seco in Pasadena. That took an extra weekend to finish up (story for some other time, perhaps). After that we decided on the Piru which has a middle section and an upper section. The upper was harder and a little low so we decided the middle was a better choice all around. And it was. The paddling wasn't too hard but enough to make me nervous now and then; the scenery was incredible; and the company was outstanding. It always remained one of my favorite river trips in spite of the log jammed shallow scraping for the last several miles followed by a bitter lake crossing into fierce headwinds. And since that time six years ago I have longed to get on the upper sections - supposedly the same great scenery and better whitewater and still less than an hour from downtown Los Angeles. But the Piru is fickle and often only runs for a day (or less) after big rain storms. So the timing never worked out. Now I live several hundred miles north of L.A but I still keep my eye on the flow of the Piru. With our recent flurry of winter storms leaving snow even in the south there has been snow melt feeding the Piru. And it gave the creek a more predictable flow window that lined up with one of my days off from work. So with an all too easy convincing of my buddy Alex to ditch his job for a day I prepared for the twelve hour round trip drive to get on a fifteen mile class IV/V wilderness run within shouting distance of ten million people. So what was the end result? Yet another river experience that I expect will stay with me for a long time and one that has made me more excited than ever for the upcoming season of exploring seldom run rivers with good friends. The truth is that the whitewater wasn't as good as I was expecting. Perhaps that's because I had built up all too high expectations, or perhaps because of the long sections of willow dodging and manky rapids. But there were definitely some fund drops in there. And the scenery wasn't quite as good as the middle section - though still quite impressive given its location. No, what really made it great was the return to that spirit of adventure, that sense of exploration and of being out there with a good friend. That is the essence of why I kayak the river and that is what I plan to focus on this season. Here are some more pictures and below is the video - which probably makes it look even better since I cut out the bad bits.